The AMS Titanium Race Series Cat-Back Exhaust System is a no-nonsense, all business exhaust system upgrade designed to make the most power and shed the most weight off your vehicle. Our exhaust features .049” thick titanium piping for the best exhaust flow and lightest weight. This system does not have any restrictions like other popular exhaust systems that “neck down” and hurt performance. It’s a full 3 inches throughout. Like all other AMS exhaust products this cat-back is TIG welded with 100% titanium components including the flanges and hangers. The system utilizes factory exhaust hangers and includes a high quality tip & muffler. 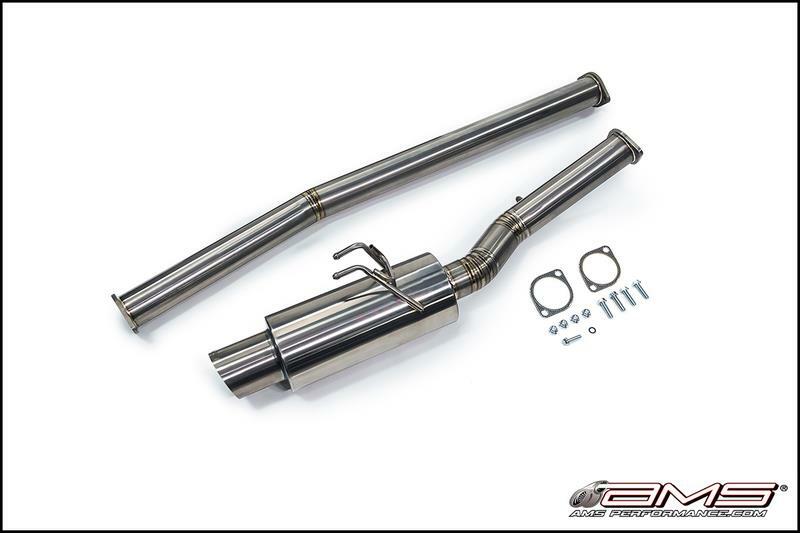 If you’re ready to take it to the next level, our AMS Performance Race Series Cat-Back Exhaust System is also offered with all the components to turn in into a full Turbo Back system; including SS downpipe and your choice of SS or Titanium midpipe (resonated, non-resonated or high flow cat).